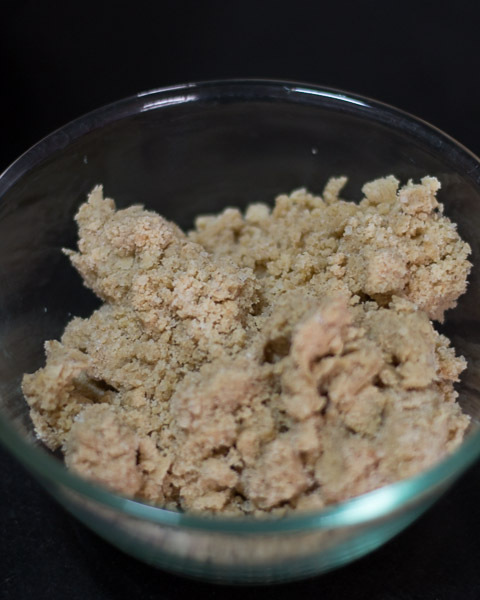 Carlos Bakery German Crumb Cake recipe with bun dough. Old fashioned New Jersey Hoboken crumb cake Cake Boss Buddy Valastro Style. With step by step pictures. I first saw this Crumb Cake in an episode of Cake Boss. 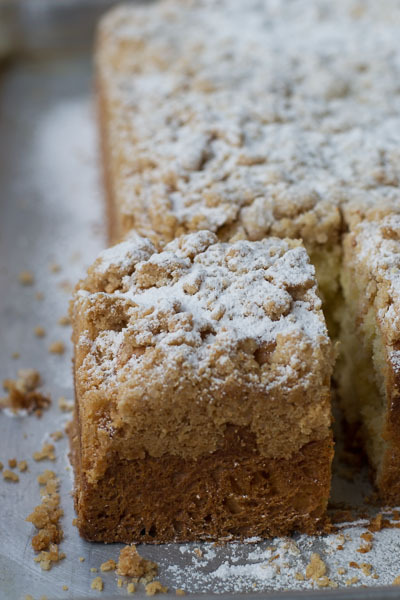 Buddy Valastro made this Crumb Cake and it looked to die for. Its not always these big cakes and pastries that attract me. I love simple everyday cakes like these Crumb Cakes. Buddy Valastro tells that the Crumb Cake recipe is more than 100 years old and came with the bakery when his father bought it. 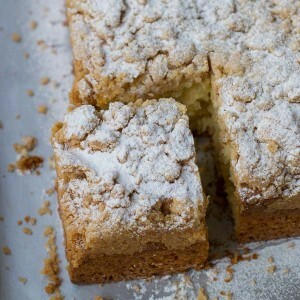 It is an old fashioned German crumb cake called Streuselkuchen. They used some of the leftover cake scraps from the bakery to make that awesome topping. Genius. The topping consisted of crumbled cake, sugar and butter and of course some secret ingredients that Badabing Badaboom – The Hoboken boy wont tell. I wanted to try. I wanted to try. I tried a lot of Crumb Cake recipes before nailing it on this one. Carlos Bakery describes this Crumb Cake as “Piled high with thick, jumbo golden crumbs, our crumb cake is the stuff of legends! 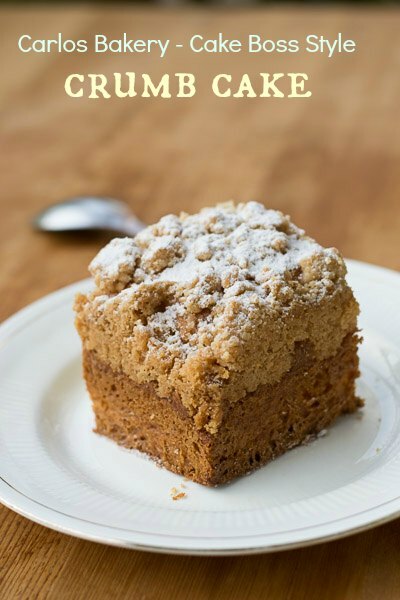 Made with brown sugar, butter, and cinnamon, over sized crumbs sit on top of authentic German bun dough, a sweet addition to your day!” So come with me, Lets make a copycat Crumb Cake Hoboken Style baby. First, lets tackle the dough for Crumb Cake. 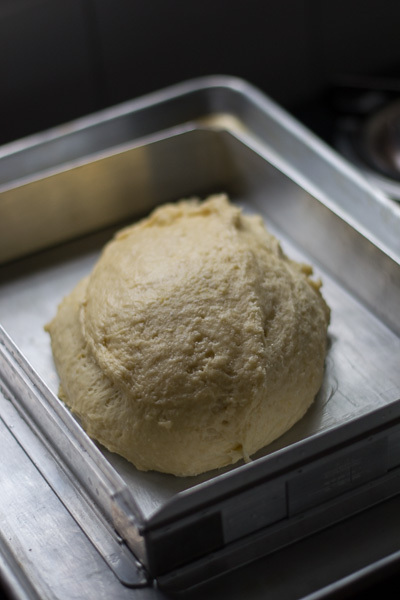 The dough is very rich, more like a french brioche dough. Its a very very sticky dough. Take a small bowl. Add in the yeast, 1/2 a cup of warm milk and 1 tablespoon of sugar and let it rest until the yeast is dissolved and foamy, about 5 minutes. 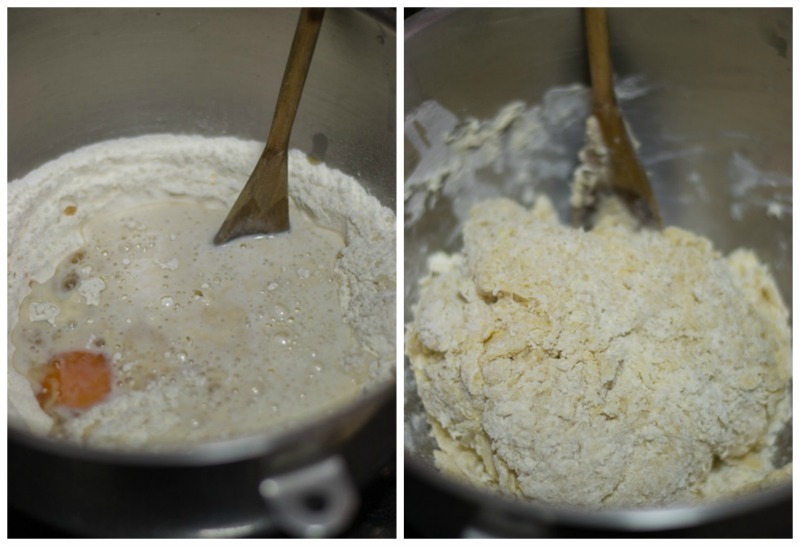 Take a big mixing bowl and add all the remaining ingredients listed for the dough except the butter. Add in the yeast mixture too. Mix everything with a wooden spatula just until combined. Slowly add in the butter in small pieces and start kneading. I kneaded by hand. If using a stand mixer, knead for 5 minutes on low speed. Don’t add additional flour while kneading. The dough will be extremely sticky. Knead for a GOOD 10 minutes by hand. Scrape the dough from the bench with a help of a metal scraper and fold it onto itself like the picture below. 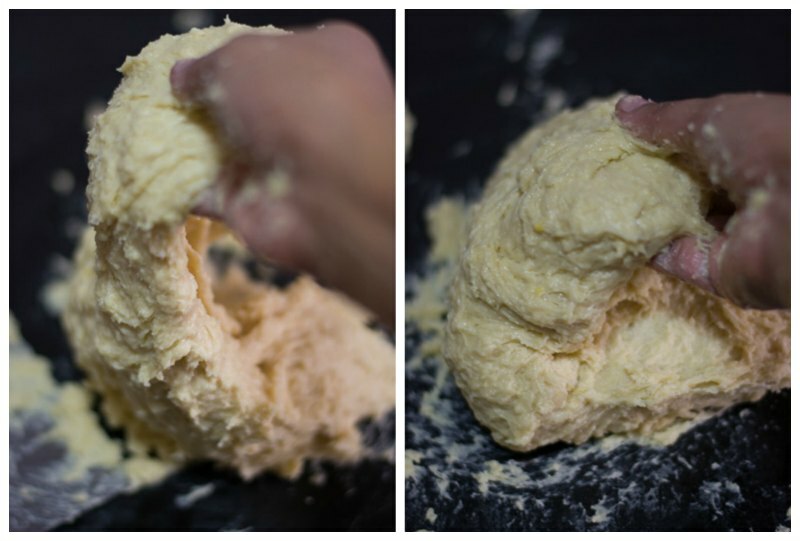 Scraper is a very essential tool for kneading sticky dough. 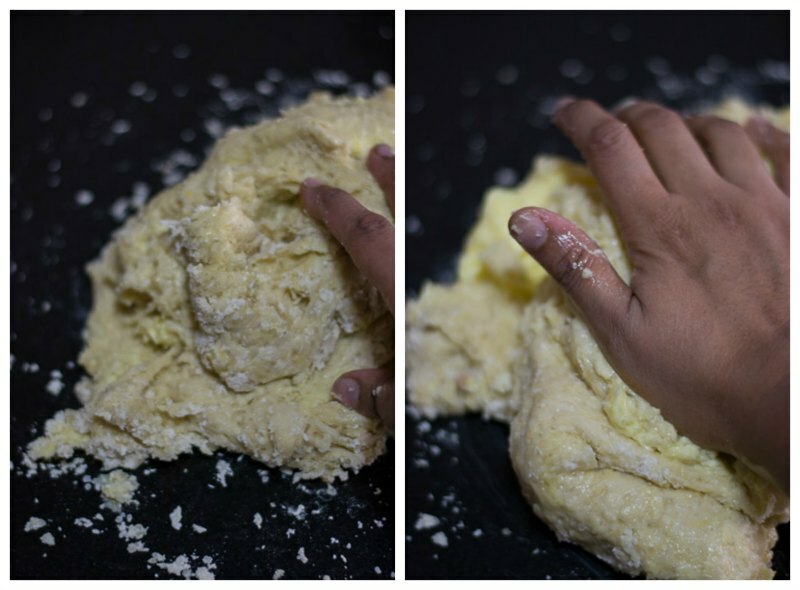 Repeat till completely kneaded. The dough will slowly come together but will remain very very sticky to touch. Remember NOT to add extra flour while kneading. It will come together as one single mass of dough. Just scrape the dough and place it on a bowl. 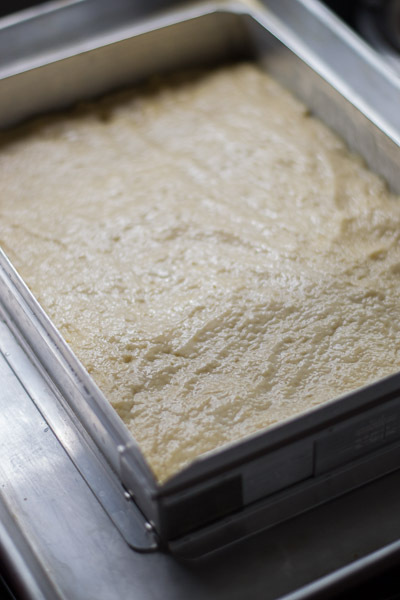 Cover the dough with a plastic wrap and let the dough rise in a draft-free place at warm room temperature until doubled in bulk. I use a shower cap to cover the bowl. Its a cool idea! It will take about two hours to double in bulk. Final Rise of Dough and Baking Crumb Cake. Butter and line a 13- by 9-inch baking dish. 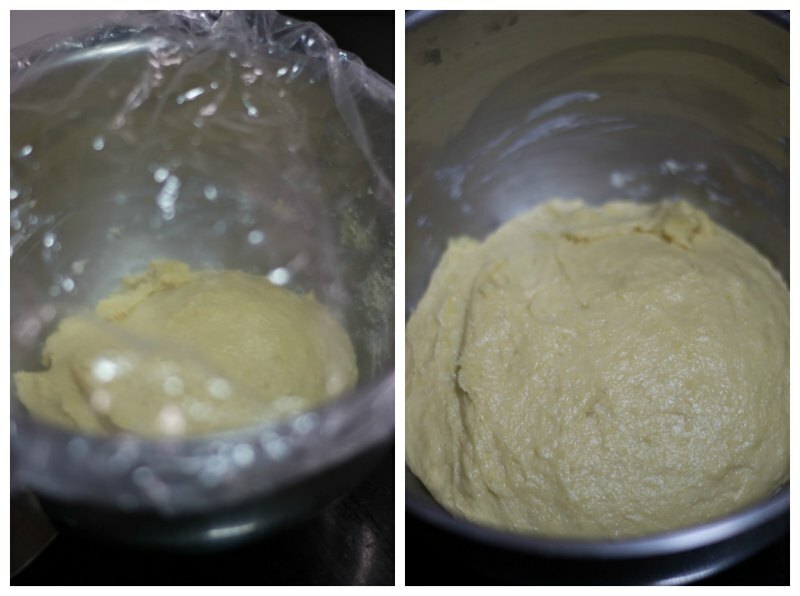 Remove the dough from the bowl gently and place it on the baking dish. Wet the hands in cold water and spread the dough evenly on the pan. Sprinkle all of the topping on the dough and gently press the topping with your fingers. Cover the dough with a kitchen towel and let dough rise again in a draft-free place at warm room temperature until almost doubled in bulk, 1 1/2 to 2 hours. Put the oven rack in the middle of the oven and preheat oven to 350°F /180°C. 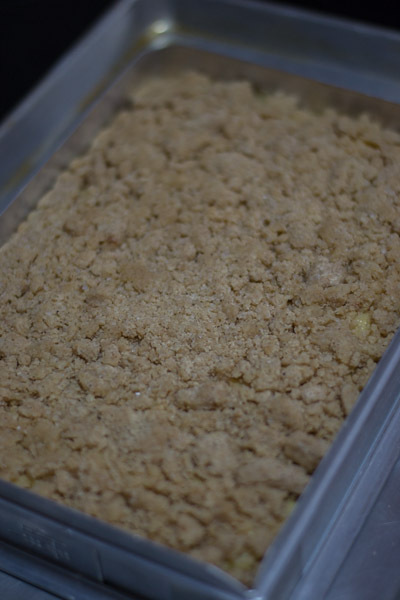 Bake Crumb Cake until topping is golden, 55 to 60 minutes. Cool Crumb Cake in pan on a rack until barely warm. Sprinkle confectioners sugar on top of the Crumb Cake. 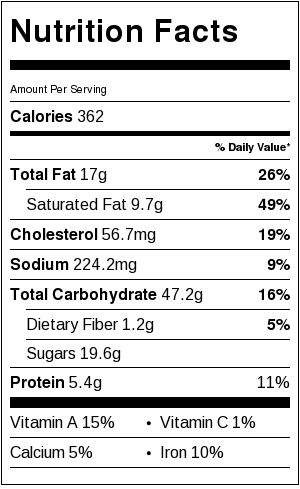 Just sift some sugar in a strainer on top of the Crumb Cake for even distribution of sugar. Serve Crumb Cake WARM. Always!! 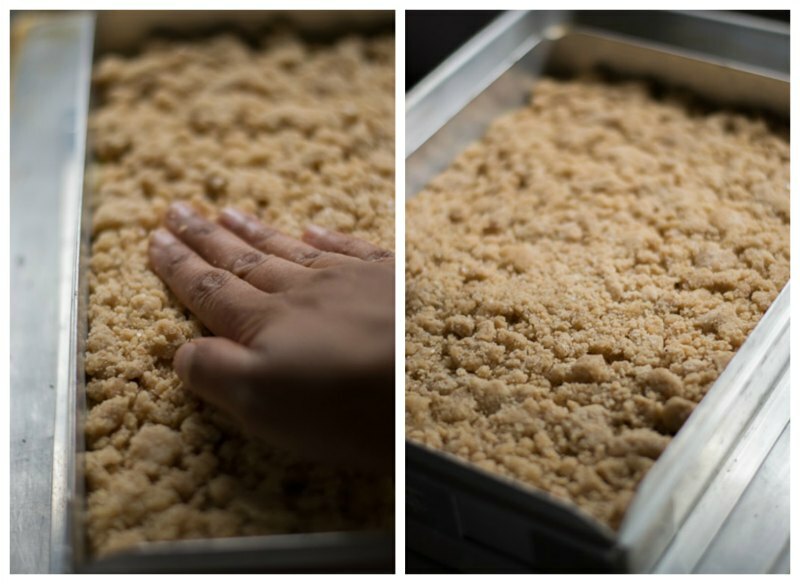 Leftover Crumb Cake can be warmed in a microwave for 10-15 seconds and served. 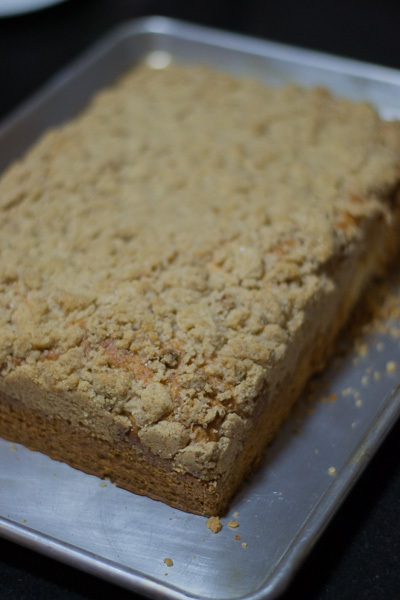 Recipe for Carlos Bakery German Crumb Cake. Old fashioned New Jersey Hoboken crumb cake Cake Boss Buddy Valastro Style. Take a small bowl. Add in the yeast, ½ a cup of warm milk and 1 tablespoon of sugar and let it rest until the yeast is dissolved and foamy, about 5 minutes. Take a big mixing bowl and add in all the remaining ingredients listed for the dough except the butter. Add in the yeast mixture too. Mix everything with a wooden spatula just until combined. Don’t add additional flour while kneading. The dough will be extremely sticky. Knead for a GOOD 10 minutes by hand. 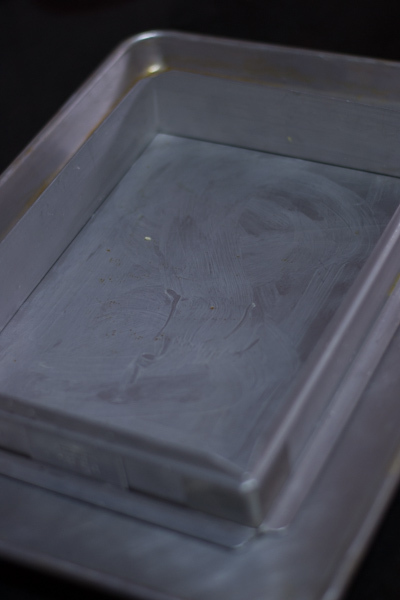 Scrape the dough from the bench with a help of a metal scraper and fold it onto itself. Scraper is a very essential tool for kneading sticky dough. Repeat till completely kneaded. The dough will slowly come together but will remain very very sticky to touch. Remember NOT to add extra flour while kneading. 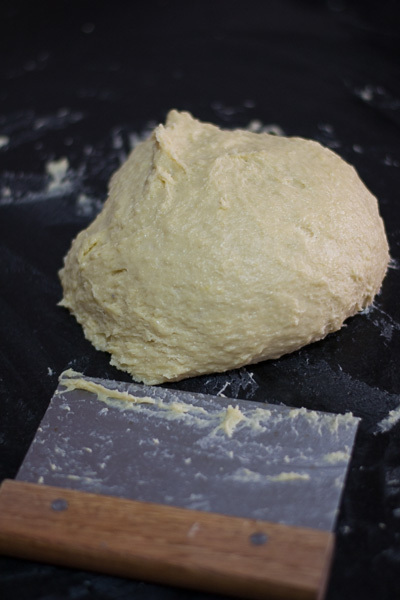 Cover the dough with a kitchen towel and let dough rise again in a draft-free place at warm room temperature until almost doubled in bulk, 1½ to 2 hours. Put the oven rack in the middle of the oven and preheat oven to 350°F /180°C. Bake until topping is golden, 55 to 60 minutes. Cool cake in pan on a rack until barely warm. Sprinkle confectioners sugar on top of the cake. Just sift some sugar in a strainer on top of the cake for even distribution of sugar. Recipe adapted from Ruth Cousineau. 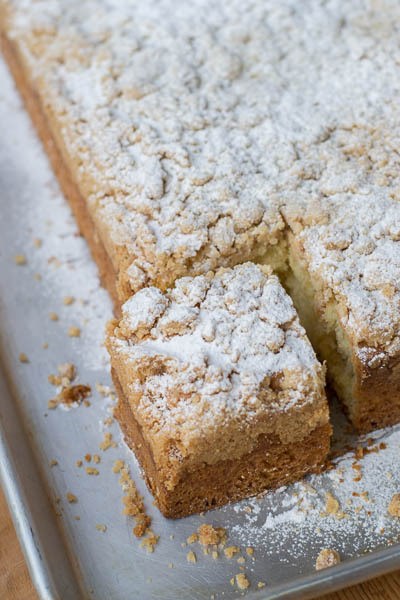 Crumb cake is best when freshly made, but leftovers can be rewarmed and served. Looks good. Will make this soon. Where did you get that lovely rectangle pan from? Hi Suguna, I have been trying your wonderfully tasty recipes for quite sometime now. This one turned out great as usual. It was absolutely a different taste and yet so comforting! Thank you for your great website. You should soon create an App too. Take care! 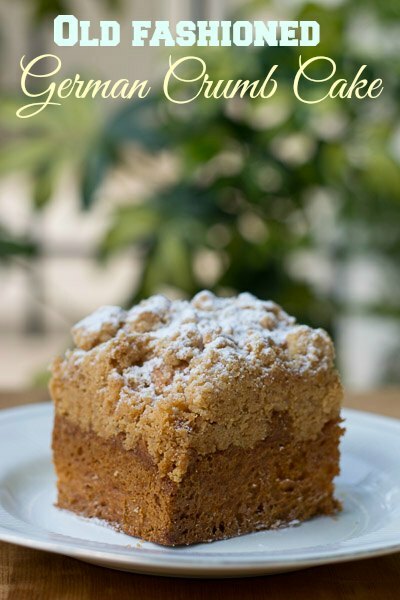 Thank you for this recipe on German Crumb Cake. Question: on the flour amount in the cake recipe, should I have simply scooped or leveled the flour? I tried to make the base dough this AM but it was just too soft and would not form into a ball. Perhaps my eggs were too large, or there was not enough flour? I scraped the dough into my baking pan and it is rising in that pan right now :). 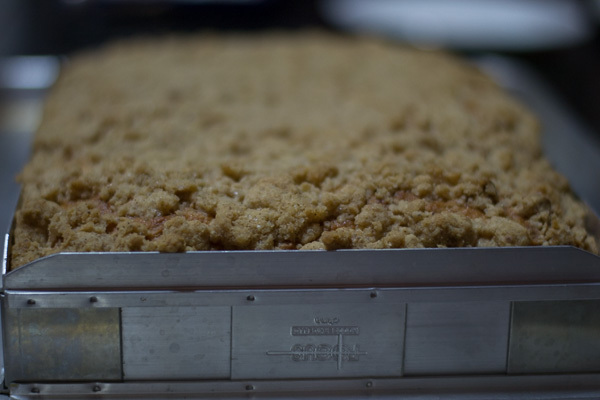 After I add the crumb topping, I will set it up to rise a second time. Any tips you can offer are appreciated. Yup. Its just leveled flour and this is a very sticky dough. The dough will slowly come together after kneading but continue to be very tacky. Dont worry. I think you are good. The softer the dough, the softer the cake! Hope you kneaded well.